That depends on if the basement is finished and to what degree… of course, if the basement is finished and you’ve experienced water penetration, then likely you’ve also been frustrated by the damage it’s caused. Solution: In this example, you can see how adding a floor drain as part of the basement waterproofing system does not affect the look or functionality of this basement – and typically, the work is completed within 2 days. Be sure to check out our Before and After examples of basement waterproofing to learn more. Problem: These home owners in Sarnia were experiencing a leaky basement. Water was penetrating regularly through the block concrete walls. The air was damp and musty smelling. During the winter months, the basement was very cold. Solution: We installed our waterproofing system which directs the leaking water away from the walls and floors and into a new drain and upgraded sump pump system. We finished off the walls with our ThermalDry® Basement Radiant Wall Barrier which will improve the basement environment during the cold winter months. I have one corner of the basement which leaks when rains heavy or now as the snow melts. Need a free quote. Water leaking into basement south and west sides. Hi, I would like a quote to install an dehumidifier in my house in Sarnia. Thanks. We have a cold room under our front concrete stairs... it gets damp, and we can't use it because everything gets mouldy that gets stored in there. We would like to utilize this space and use it for storage. Can you help? Had some mold growth on a baseboard, had plumber come to check pipes they were fine, could be water from foundation. Concrete driveway has sunk to uneven levels over the years and slopes toward the house now. Also some uneven concrete walkways. The representative explained different options & let me choose. I have to admit - priced helped. 'Very good job', 'The best people', 'Helpful and nice', 'Over and above their duties'. Very satisfied with job done. We are very pleased with our new sump pump and we would be happy to recommend Advanced Basement Systems to others. Worked well as a team. Very satisfied. Great guys, know what they are doing. Fast and efficient. You are the best company, I trust you completely. Great investment. Glad we had it done!! Thank you and will definitely recommend your company to our friends. Friendly- not pushy- answered all my questions. The day after it rained very hard and not a drop came in. I had other contractors coming out but cancelled with them after talking to Dan Clancy. "A great job done by Adam and his crew on March 11th and..."
We not only adhere to the highest industry standards, we strive to be the industry leader in the home improvement related services we provide. We also use state-of-the-art products and technology which are designed to fix your home. 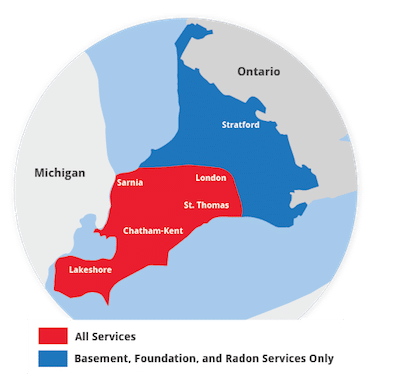 We are the authorized Basement Systems dealer in Sarnia, ON. Thermal Dry Wall product is installed and mechanically fastened. This wall product is one of our most popular products of all time! It also reflects up to 97% of heat back into the basement space. This unit has one submersible 1/3HP pump with a DC battery back-up. The back-up system can pump nearly as many liters per hour as the main submersible unit! Odours in the basement can be caused by multiple issues. In this case, the insulation and wood on the basement walls is wet and starting to smell. We are removing and disposing of what you see on these walls. We have a leaky basement bedroom that needs repair asap. Can you please assist. I need some advice on what I can do or what needs to be done with some water runoff around my home. Please help!! We have an existing/ very old sump pump, which has an extremely small basin. looks like prior home owner may have done it them selves. I'd like to look at increasing the basin size, with a closed system. The one now STINKS. currently there is not even a check valve so when it pumps out, half comes back in. Also there are two french drains maybe? that collect water in the stair well that then runs into the house and pumped out through the sump. CAN of WORMS in general and would like to fix. Looking to get my crawl space under the house updated and was looking to get a quote for this. Water leaked into basement during heavy rains last week. It appears that there is a crack in the foundation wall where the leak occurred. Have water coming in the basement along one wall when it rains. Unable to find a specific source - I'd like someone to come out to have a look at it and give me a quote.